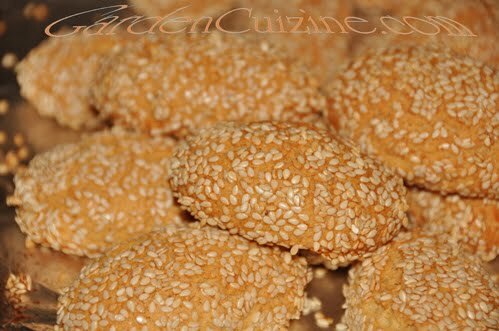 Italian Sesame Cookies can be part of a healthy diet, when enjoyed in moderation as a snack. Their nutty aroma and wholesome taste make these cookies delicious anytime of day. They are low in sodium and not as sweet as traditional American cookies. The fact that Sesame Regina are lower in sodium is what I like most about these Italian favorites. In addition to being low sodium, they have added calcium and nutrition from the coating of sesame seeds. Italian cookbook author, Victoria Granof, writes in her book, 'Sweet Sicily, the story of an Island and her Pastries', that when she attended an All Souls' Day carnival in Palermo, Biscotti Regina were sold everywhere. My mama would love it there, since Italian Sesame cookies are one of her favorites! I asked Mom if she remembered having sesame cookies at home growing up. She said, "We had them throughout the year. Whenever Dad (Alexander Salottolo) would go downtown, he would bring us home sesame cookies from Ferrara's (NYC bakery); especially during the holidays...they were my favorite." Apparently, my Grandmother didn't bake these. As you could probably guess, unlike my Grandmother, I bake these cookies often and throughout the year especially for Mom; they have become a regular in our cookie jars. On my quest for home-baking the best sesame cookies, I came across Paula Laurita's recipe (the Italian food editor of Bella Online). I have tried other recipes in the past and made many a variation in industry and restaurants, but it was this -- ever so slightly modified -- version of Laurita's recipe that got the nod from Junetta, my Italian Mama. This authentic Italian cookie recipe was the closest to what she remembered and enjoyed growing up. The base recipe was already low in sodium. My healthy recipe modifications were few, primarily substituting some of the saturated fat (butter) with unsaturated fat (oil), along with adding a hint of fresh grated lemon zest. I did try to reduce the egg yolks, using two eggs and one white (rather than three eggs), but the three eggs were preferred in GardenCuizine's test kitchen trials. The amount of sesame seeds in the original recipe were not reduced, even though the seeds do contribute some fat. The fat they contribute is "good" fat. Yes, we do require some fat in a healthy diet. Fat is important for many reasons, such as for healthy skin and hair, and to help our bodies absorb fat soluble vitamins A, D, E, and K.
Sesame seeds contain healthy fats as well as nutrients. Sesame seeds contain essential fatty acids omega-3 and omega-6 as well as mono and polyunsaturated fats. 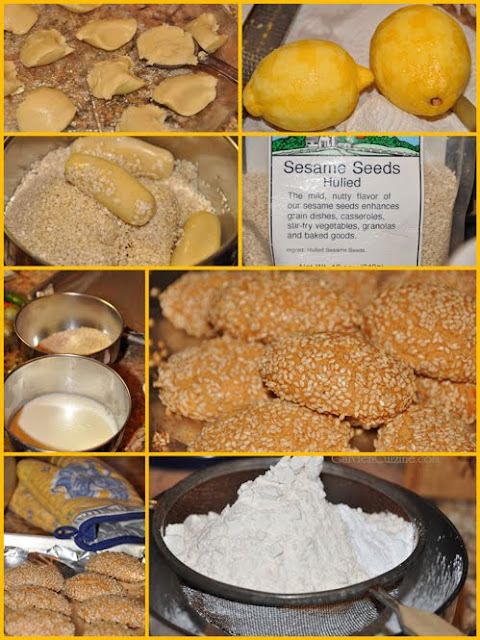 The sesame seeds add additional nutrients too, such as calcium, iron, magnesium, phosphorus, copper, manganese and fiber. Sesame seeds are best stored frozen until ready to use to avoid going rancid. I usually store all our seeds in the freezer in airtight baggies or freezer-safe containers. Have you ever noticed that cookies in general, seem to taste even better when they are shared among family and friends? For a thoughtful homemade gift, place your homemade cookies in a cookie jar, tin or air tight container. For an added touch, attach some curling ribbon and a personalized card made on your computer. * Note: The cookie dough could also be rolled in long logs, brushed with milk, rolled in seeds, then cut into 3-inch pieces.